Do you agree or disagree with what Mohamad Bitar did, and why? Should we admit when things don’t go the way we planned? It’s a tough one. Few corporates hold up their hands when plans go awry (unless there’s a crisis of biblical proportions). US-based corporates such as Walmart are now taking on media outlets to argue their point (this post from Walmart is a remarkable example of fighting back). Even fewer company bosses in the Gulf go off track and talk from the heart. However, as with everything there are exceptions. Just Falafel is often touted as a home-grown success story, a tale of how a local brand has become global. Founded in 2007 in Abu Dhabi, the falafel-focused outlet has approximately 52 stores in 18 countries according to its website. However, the chain isn’t to everyone’s tastes. 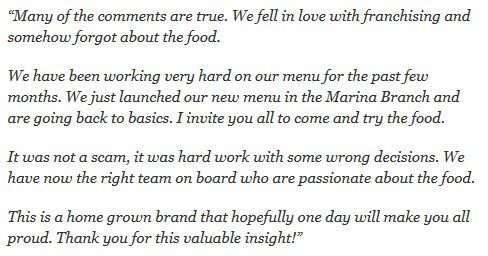 A news story on the English-language website Arabian Business which announced the reasons for the departure of the chain’s former CEO Fadi Malas was used as a comment board by readers to explain their reasons for not liking the brand’s falafel. Fair enough you may say. But what followed was either inspirational or horrifying depending on which side of the open/control communications fence you’re on. 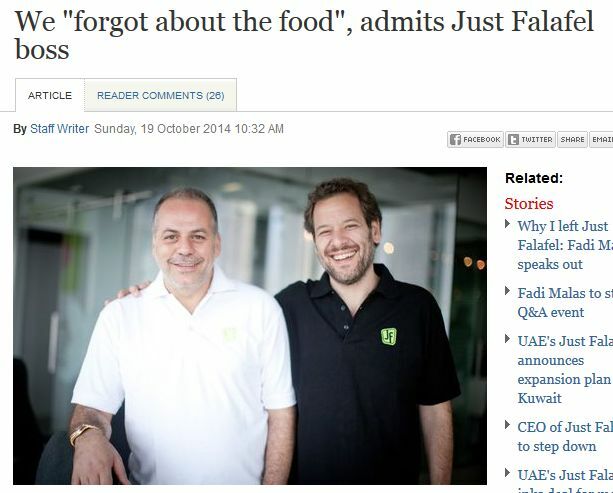 The Just Falafel founder and MD, Mohamad Bitar, took to the site’s comments section to explain how the company had “forgot about the food”. The hacks at Arabian Business then took Bitar’s comments and span out a new story, to which readers took to explain what they believe went wrong and how Just Falafel can put it right. For some consumers, an admission of error can be a powerful tool to reassess and re-engage with a brand. For others, it’s all about projecting an image that others can believe in, and not deviating from that message. Is Mohamad Bitar’s message a moment of genius (if we were in America, I’m sure we’d be calling his move crowd innovation), or does it signal a need for someone to crack the whip at the brand and get everyone on message? This entry was posted in Marketing, Public Relations, United Arab Emirates and tagged arabian business, crisis communications, Fadi Malas, fast food, Just Falafel, Mohamad Bitar, reputation management, UAE by alexofarabia. Bookmark the permalink. Just Falafel pretended to be what it is not. It’s not an international food company. It’s a middle easter food company and should stay this way, although it should improve the quality and health side of the falafel. In Lebanon, they have failed miserably. A store opened across the street from my house, and I watched everyday how the traditional falafel store was full of people while Just Falafel was chasing flies. Customers aren’t daring enough to try new recipes when a traditional meal, such as falafel, is ingrained in their head. When you say falafel, we smell the aroma of the crispy falafel with the luscious taste of Tahina sauce. It can’t happen otherwise. On a different note, you can’ outsmart the customer. the cost per serving was too high and was not accepted by the regular consumer with an average of 4 family members. Just Falafel is not Starbucks, as it doesn’t provide a life style offering, therefore they can’t charge for falafel what starbucks dared to charge for coffee. At lest not yet. Simplicity always pays off whether in designing a business model or the interior of an office. This is the philosophy we use at http://www.farrellymitchell.com to transform companies and increase their value. The problem was the whole business was based around creating hype to encourage the growth of the franchising. This hype included buying Facebook likes by stealth and then leveraging this to the public as a social media ‘success’ story. Why did nobody ever call Just Falafel out on this?! I stood in the room of a a large Arab digital summit in Beirut in 2013 while the top guys at JF got a standing ovation from all these digital experts! It was so OBVIOUS from the start. Just take a look at quick their social media channels – there is absolutely ZERO engagement for any of their posts or ‘content’. Almost 2 million likes on Facebook and JF are hard pushed to get more than 10 people to click like, comment or share anything? What a total marketing and PR scam and so many people and publications fell for it. And yes, the food is dreadful too.